A true Canadian landmark known as Calgary's most elegant and recently fully renovated hotel. Just footsteps away from Calgary's best shopping, sporting events and music festivals, guests are provided with an array of activities and events to choose from ensuring a memorable stay. 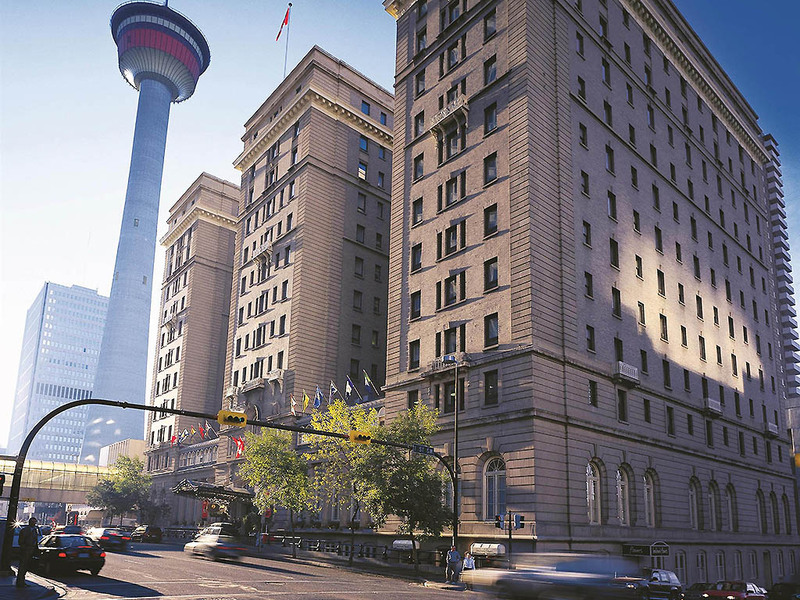 The Fairmont Palliser is the cornerstone of Calgary's corporate community offering timeless luxury and modern amenities for business or leisure including the personalized service of Fairmont Gold. We are thrilled to announce the latest addition to Fairmont Palliser, Hawthorn Dining Room and Bar, officially opening on April 2, 2019. Each of the 407 guest room accomodations at The Fairmont Palliser in Calgary have been recently renovated, reflecting out storied history and dynamic, exciting future. All guest rooms are equipped with the latest business amenities including High Speed Internet Access and entertainment features such as in-room movies. The tea hour is always an intimate one; relax with our menu of assorted berries and Grand Marnier cream, delicate tea pastries, fresh dainty finger sandwiches and oven-fresh vanilla scones to enjoy with tea offerings in loose leaf and bagged teas. The time-honored tradition of Sunday Brunch, is back. Enjoy seasonal features with classics such as eggs benedict, carved roasts, seafood, salads, made-to-order omelets, our famous Belgian Waffles and decadent desserts from our pastry shop. With seating for 32 and a full line of Starbucks retail products for sale, we invite you to stop in for a personal handcrafted beverage and a fresh signature pastry. A new era of dining at the Palliser starts with opening of Hawthorn Dining Room & Bar re-defines the Calgary culinary experience with sociables and family-style dining from Alberta's most trusted producers, farmers and suppliers. Fairmont Palliser is excited to introduce you to The Boulevard Restaurant. Located on the Boulevard level of the hotel, this intimate restaurant space will be open from 6:30am until midnight daily. Great hotel. But heard the trains throughout the night which kept me up. Service was great. We were warmly welcomed and immediately served. Staff were friendly and made us feel at home. Check in on my arrival was over a 10 min wait. I express checked in on line but the express checkin was dealing with guests with issues. The one other person helped me finally. Everything about my experience there was awesome. Thank you very much. No soundproof from hallway to room, unruly behaviour of guests in the hallway at 3 a.m. without any consequence. It was extremely beautiful place to stay, and the staff where all fantastic! Warm welcome on arrivalWarm welcome on arrival, particularly helpful with additional amenities due to luggage delay. Enjoyable food, Service in the new bar area was not to the standard previously experienced. Check in was a breeze, our room was really nice, we dined at the new restaurant and food was great. After the game we came back and had drinks in the bar. The darkening curtains in the room were much appreciated the next morning. The staff were outstanding to us. It was our 45th anniversary and the young girl who checked us in had a card delivered to us with chocolate coated strawberries. Very nice. As usual, the entire experience was excellent. From Neil at the Valet, Amanda for checkin, and Sarah in the lounge - every staff contact was outstanding. Peaceful and comfy. We love this hotel and it did not disappoint. Service great & room comfortable. Only drawback was being on side or railroad... got zero sleep. I'm sure the window closed as well as curtains would have helped but I'm a person who needs to sleep with open window. Other wise, service staff top notch. Regrettably, did not have opportunity to try new restaurant or any of your amenities.... maybe next trip to Calgary. Room is big and clean, location is good. SMS room service delivers my additional needs (tea bags) efficiently. The worst stay at a fairmont I have ever had. The hotel and staff were great as always but the overall stay was a complete nightmare, the room next to us was 802, was up both nights fighting like crazy, between 2-6am which was the result of zero sleep and of course for whatever reason they slept though the night, first night i talked to them myself to calm down second night i have to call security on the guests was absolutely insane... again not staff fault and i appreciate the free parking but doesn't mean much when its the gold level and $400 plus a night to have a stay go so horribly wrong. The room was clean and comfortable and the location ideal. However, I was on the second floor and did not have a good nights sleep during my stay because of the noise of the train. I woke up several times during the night. I enjoyed the comfortable bed, the historical feeing of the room and hotel (very elegant), and the restaurant was fabulous. Always love staying here however the scent that is pumped in by the elevators is overbearing. The items in your restaurant menu are trying to be a bit too different and pricey. The lotion in the rooms is quite perfumery. Now a days going towards a more natural scent is better for health.